Ajiaco is a unique Colombian dish, especially beloved in the city of Bogota. It's a hearty chicken soup made with potatoes and corn on the cob. Small yellow Andean potatoes called papas criollas are the important ingredient—they dissolve and thicken the soup as it cooks. It is a great menu for a cold night, all in one pot. Serve with artisan bread and Spanish Albarino wine. 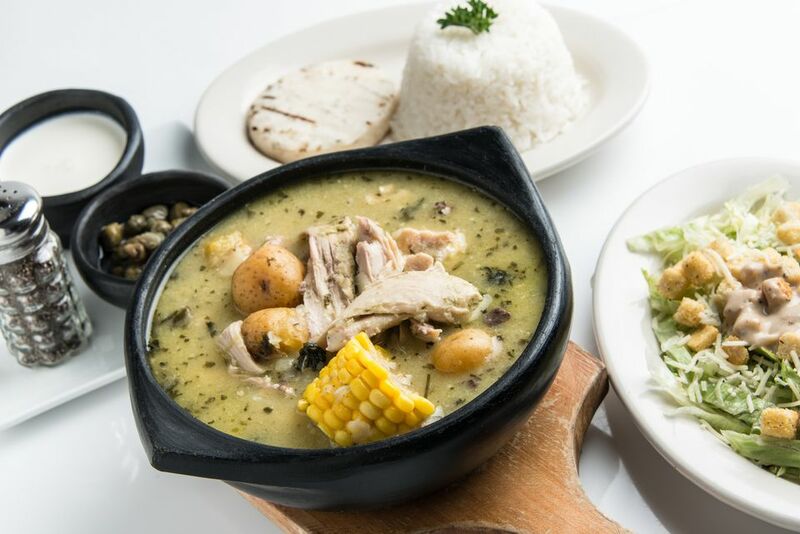 Ajiaco is seasoned with a Colombian herb called guascas and is traditionally served with slices of avocado, capers, and a mild sour cream. Cubans make a stew version of ajiaco that includes beef, pork, chicken, and vegetables, and in Peru, this dish is a side dish of potatoes, garlic, chilies, and herbs. You can usually find frozen papas criollas as well as dried guascas at Latin food markets—they are worth seeking out if you decide to make this dish. Place the chicken in a glass or ceramic dish. Top with the onion, garlic, salt, and pepper. Cover and refrigerate for 8 to 24 hours. Heat the olive oil in a heavy 4-quart lidded pot over medium-high heat. Add the chicken with its marinating bits and brown each side, about 6 minutes. Pour in the stock and raise the heat to high. When the mixture boils, lower the heat to medium-low, then cover and simmer. Cook until the chicken is tender, about 30 minutes. Transfer the chicken to a platter, reserving the cooking liquid in the pot. When cool enough to handle, remove the skin from the chicken and discard. Cut or tear the chicken breasts into bite-size strips and discard the bones. Place the potatoes in the pot with the leftover cooking liquid and turn the heat to medium. Cover and cook for about 5 minutes. Add the corn, cilantro, green onions, and the guascas. Simmer, covered, for 20 minutes, or until potatoes are tender, but not overcooked. Remove the cilantro and green onions and return the chicken to the pot. Simmer a few minutes more until the chicken is warmed through. Ladle the soup into individual bowls and place the toppings on the table to be passed around.